Now, I have an admission to make. For many years I didn’t rate the band James. For a completely stupid reason I’ll admit, but still one that illogically blinded me to the talents of this great band. And it’s one song. Just one song. And I reckon that you’ll probably know which one it is already. But it is a song that blighted my Friday nights for sometime. In the early 1990’s I worked in nightclub security with one of my regular gigs being the local polytechnic students union where every Friday the DJ would finish with the same 5 songs; One Step Beyond by Madness, Come On Eileen by Dexy’s and The Pogue’s version of The Irish Rover (by which time somewhere on the dance floor there’d be a confrontation that needed resolving) before all things were calmed down by You’ll Never Walk Alone by Gerry And The Pacemakers. But the fifth track caused chaos, being Sit Down by James, which resulted in 500 odd drunk students sitting down just before chucking out time. And could you get them back on their feet, could you hell! As I say, a totally illogical reason to not rate a band. But still, when James kind of disappeared in the early 2000’s, I wasn’t too affected really. I didn’t particularly miss them. I didn’t mourn the lack of new music from them. And, when they returned with a new album in 2008, I wasn’t too fussed either. But that was a mistake. A huge mistake. One which I question myself constantly about, on each occasion I see the band perform live and every time they release a new album. The thing is, and as regular reader’s of my reviews will know, the one thing I hate in music is blandness. I hate sameiness in music, identikit vocal styles dictated to by people who know how to sell a product but nothing about producing or supporting an artiste. I detest music that has no character and I abhor music I cannot believe in. I want music with soul, with guts, with balls and I want music that is different. Like going to an art gallery where you’d be bored quickly by print copies of the same work endlessly repeated, I want to buy music that covers all ranges, all topics, all genres and all styles. In Tim Booth, James have a frontman of unique voice, that sets the band apart from many others. As a live performer there are very few equal to Booth; however, more importantly, he is also able to translate his charisma and performance to recorded material, a skill that is so very rare but also so very important. In listening to ‘Living In Extraordinary Times’ you get the impression that Booth and the band are performing their works to not a producer and studio engineer, but to a gig full of fans. The album has a flow that creates that feeling, that turns your listening experience into a immersive and personal one. One that whets the appetite for forthcoming live performances of these songs. James have always been a talented group of musicians blending the disparate influences of folk, soul, funk, rock and Britpop into the gorgeous melodies and tunes that underpin the lyrics they support. They understand light and shade; loud and quiet. They know exactly when to smack you in your ears to make their point before changing tack to gently massage their message into your consciousness with subtlety and beauty. James have that ability to make you angry and passionate, sad and disconsolate, happy and positive and often in the same song. 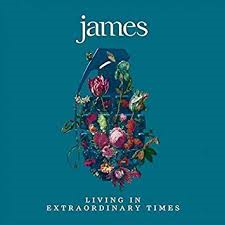 And, as the title of the album suggests, with the uncertain and unprecedented times we currently find ourselves living in, James have a message that they express with their typically acerbic way. Right from the opening track, Hank, with its references to gun massacres in the USA and how it eludes to the damage being done to democracy, the point is made that these extraordinary times are of our own making. The question ‘what are we doing’ is asked but crucially, a direct answer is never given. This album doesn’t try to lecture through belittlement or ridicule; instead it tries, and I feel succeeds, to educate and lead us to find the answer ourselves. Yes it is extraordinary the world we live in and it is our responsibility to do what we can to make sense of it. But this album helps us make sense of it, and brings us to the understanding we can do something about it. And that is both a worthy and exceptional quality for which James must be applauded.